An Arizona State biology lab uses virtual reality as part of the curriculum. Students will use the virtual experience to practice taking a patient’s blood and analyze plants and animals on distant virtual planets. (Photo courtesy of Arizona State University). Arizona State University biology students will start doing labs using virtual reality this semester. School officials claim the university is the first school in the nation to incorporate the technology into a biology course. At most universities, student loan money helps to pay for tuition, room and board, and textbooks. This semester, biology students at Arizona State University will use those same funds to pay for a new kind of educational tool: virtual reality headsets. 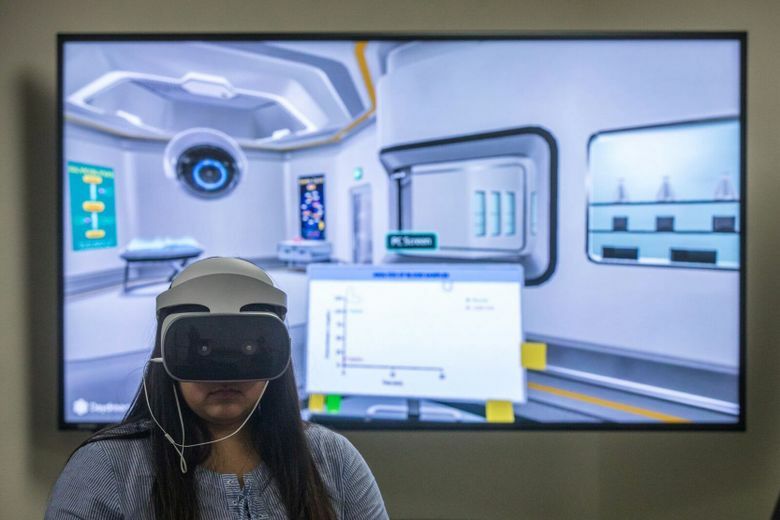 Long popular with gamers drawn to immersive fantasy worlds, VR headsets are increasingly being used by scientists, doctors and even the military. Wherever there are people who need to be trained in complex environments or on high-priced machines with little room for error, there is a potential role for VR, according to Michael Angilletta, the associate director of undergraduate programs in the School of Life Sciences at Arizona State. Angilletta said the desire to provide students with engaging real-world experience prompted school officials to partner with Google and Labster – a VR development company – to create simulated environments for online students enrolled in a general biology course. Students will use VR headsets to complete the course’s lab requirements. Last week, several dozen students tried the $400 Lenovo Mirage Solo headset for a test run before labs kick off this fall. School officials claim ASU’s online biology course is the first in the nation to offer virtual reality labs. One of the students’ virtual assignments involves working in an animated lab, where they must don a lab coat and gloves before taking blood samples from basketball players to determine their glucose levels. Another scenario sends students to a distant planet with a team of scientists. The goal: figuring out how to construct a space station without harming the planet’s exotic biodiversity. Angilletta said that for that scenario, a team of ASU biology professors and Labster designers attempted to create animals and fauna that bear little resemblance to living organisms found on Earth. In another exoplanet scenario, Angilletta said, students are forced to diagnose why their team’s crops are dying, placing the mission at risk. Angilletta said when he’s immersed in the simulations himself, he has trouble taking off the goggles. Eventually, he believes, the VR will include gloves that provide users with a tactile sensory experience. The students were later assessed on their ability to perform the same exercise in a real lab. The results showed that there were no significant differences between students who practiced in a virtual environment and those who practiced in a physical lab. “Our data show that vLABs function just as well as face to face tutorials in preparing students for a physical lab activity in microbiology,” the study concluded. Scientists are also turning to virtual reality to create interactive, three-dimensional models that they used to create by hand, according to The New York Times. Creating models at the “nanoscale” – a size in which objects are invisible to the naked eye – could allow scientists to interact with those objects in radically new ways, according to a new paper in the journal Science Advances. “In domains like this, which are imperceptible to the naked eye, effective models are vital to provide the insight required to make research progress,” the paper notes. Penny Stone – a Tempe, Arizona, resident pursuing a career in biotechnology – may have gotten a glimpse of this new approach to science last week. She told the university that she preferred strapping on the headset over performing labs using her laptop. ASU officials say three biology classes – cell and molecular biology, ecology and animal physiology – will incorporate VR headsets into the curriculum this fall and next year.